In honor of mothers everywhere, we offer this glimpse of home life in the earliest days of sedentary living. 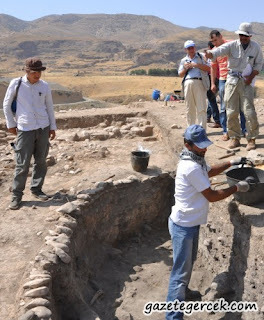 According to an article by Yutaka Miyake in the current issue of Arkeo Atlas,* recent archaeological finds suggest that Hasankeyf is one of the first places where people are known to have lived together in organized settlements. 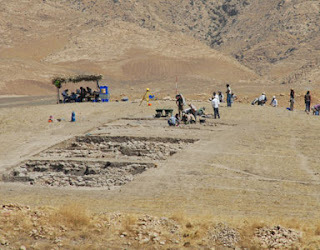 The people who settled here 11,500 years ago were hunter-gatherers, but the size, weight and abundance of stone tools discovered at the Hasankeyf Mound indicate that this community had already given up their nomadic ways in favor of a sedentary home – 1000 years before the start of agriculture and 5000 years before the invention of writing. They built homes in the round and buried their dead beneath the floor – usually with the knees folded up toward the chest and occasionally stretched out, taking measures to preserve the anatomical system. Within the 2nd half of the 10th millennium alone, the accumulation of human remains (as well as the rubbish of everyday life) pushed the ground upward by 6.5 meters. Today the Hasankeyf Mound, which is located across the Tigris River from Hasankeyf Beşir Tutuş High School, covers an area of 200 x 160 meters and rises 8 meters in height. The findings at the Hasankeyf Mound suggest strong cultural similarities with other Neolithic sites in Upper Mesopotamia, such as Hallan Çemi and Demirköy Höyük (both near Silvan), Körtik Tepe (Batman) and Gusir Höyük (Siirt). This archaeological record of Late Stone Age home life is yet another eye-popping treasure in Hasankeyf’s extraordinary open-air display. Where else in the world might one gaze upon the foundations of a Byzantine palace, picnic among the remains of Artukid villas and sleep in ancient cave dwellings, all within sight of our oldest houses? *Miyake, Yutaka. “Hasankeyf Höyük / Batman: Dicle’nin ilk köyü.” Arkeo Atlas 8 (2013): 40-47. Indeed, John. Thanks for adding yet another layer of history for us on to this oldest of settlements.